Coherent anti-Stokes Raman scattering (CARS) spectroscopy is widely used for measuring temperature and species concentration in reacting flows. During the last two decades, four encompassing issues have driven the fundamental development and application of CARS spectroscopy in reacting flows: 1) measurement of temperature and concentration of multiple species with one CARS system, 2) extension of the application of traditional ns-CARS to challenging reacting flow environments, 3) performance of nonresonant background-free and collision-free measurements in high-pressure reacting flows, and 4) measurement of temperature and species concentration at high bandwidth, typically 1 kHz or greater, to address the instability and transient phenomena associated with turbulent reacting flows in the combustors and augmentors of modern propulsion systems. Implementation of this measurement technique in harsh chemical environments has been somewhat limited by the requirement to maintain spatial overlap between multiple laser beams under highpressure, high-temperature turbulent-mixing conditions. Despite this limitation significant effort has been invested over the last decade in extending the application of CARS spectroscopy through the use of nanosecond (ns) lasers to areas such as internal combustion engines, gas-turbine combustors of practical interest, propellant burners, natural-gas engines, and industrial furnaces. The main focus of ns-laser-based CARS spectroscopy over the last decade has been to extend the capability of the CARS system to permit simultaneous detection of multiple species along with temperature and to apply this technology to challenging environments. Since the original demonstration of dual-pump CARS, multiplexed rotational–vibrational CARS, broadband rotational CARS and several varieties of CARS systems such as triplepump CARS , dual-pump dual-broadband CARS and dual-broadband rotational CARS for simultaneous detection of multiple species have been demonstrated. Researchers at SE have contributed for several key developments in these areas and also adopting these techniques for characterization of various laboratory flames as well as numerous combusting devices. CARS is a nonlinear diagnostic technique that relies on inducing Raman coherence in the target molecule using two lasers; which when probed by a third laser generates a coherent laser-like signal in the phase-matching direction at a blue-shifted frequency. A schematic representation of this process is shown in Fig. 1(a). As evident in Fig. 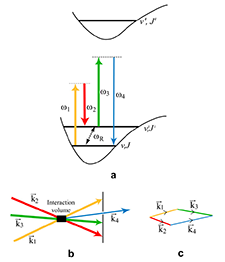 1, three photons are involved in the CARS signal generation process, as opposed to linear diagnostic techniques such as LIF and absorption spectroscopy involving one-photon excitations. Hence, the theoretical formulation and calculation of the CARS signal is a rather involved process. Fig. 1 (a) Schematic of molecular states and the CARS signal-generation process. 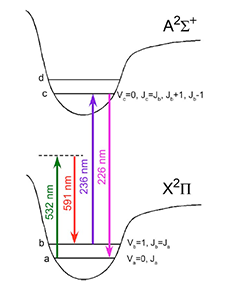 The Raman transitions between ro-vibrational states are probed with CARS spectroscopy, (b) BOXCARS configuration overlap at the interaction volume to generate CARS signal (c) Vector representation of the CARS phase-matching condition. 1. Spectral selectivity: CARS signal generation is stringently conditional upon the two-photon Raman resonant condition for the pump and Stokes fields but has the flexibility of selecting from a wide range of frequency pairs for these two fields to satisfy the above condition. Hence, it is easier to avoid spectral interference with other molecules. 2. Laser-like directional signal: Since the generated CARS signal is a coherent light, it has very high directionality. Hence, the detection of such a collimated signal requires only a small solid angle. Also because of the small beam divergence of the CARS signal, the detector can be placed far away from the sample to avoid luminous background such as that from flames. 3. Low absorption: In the most popular off-resonant CARS, since all of the participating fields and the generated CARS signal are far-off detuned from a direct one-photon transition, the loss of the pumping fields and the signal is minimal, even in a highly dense medium. 4. Excellent spatial resolution: Due to the crossing of the beams and the phase-matching condition, BOXCARS geometry generally offers very high spatial resolution. It is possible to obtain resolution smaller than 25 mm in CARS spectroscopy by employing proper focusing lenses. Ns-laser-based CARS spectroscopy is the most widely employed coherent diagnostic method for measuring temperature and major species concentration in gas-phase reacting flows. 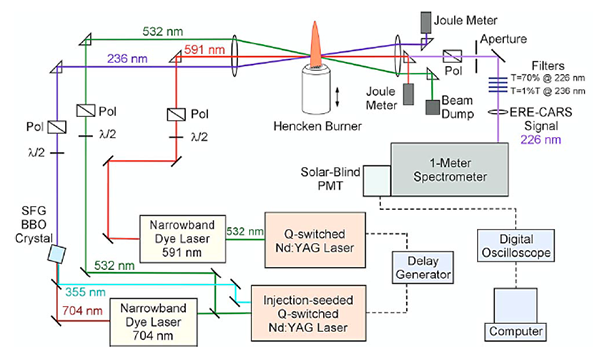 In traditional ns gas-phase CARS spectroscopy, a pump laser with a very narrow spectral bandwidth and a Stokes laser with a broad spectral bandwidth are used to create coherence in the medium, which is then probed with a narrow-bandwidth laser beam. The broadband multiplex approach enables acquisition of the full ro-vibrational or rotational spectrum on a single-shot basis. The majority of the ns-laser-based CARS spectroscopy performed over the last decade was based on a broadband multiplex CARS system. A tunable narrowband dye laser was used for polarization-sensitive CARS as well as for the development and application of electronic-resonance-enhanced CARS (ERE-CARS) spectroscopy for the detection of minor species such as NO and C2H2. Most recently single-shot ERE-CARS spectroscopy that employs a broad-bandwidth dye laser has also been demonstrated and applied to laboratory-based reacting flows. Fig. 2 Schematic of the swirl-stablized combustor and the dual-pump CARS probe used for measurement of temperature and species concentration to study various jet fuels and particulate-mitigating additives. Fig. 3 Electronic-resonance coherent Anti-Stokes Raman scattering (ERE-CARS energy level diagram for nitric oxide (NO)). Fig. 4 NO ERE-CARS experimental apparatus. 1) S. Roy, J. R. Gord, A. K. Patnaik, “Recent advances in coherent anti-Stokes Raman scattering spectroscopy: Fundamental developments and applications in reacting flows,” Progress in Energy and Combustion Science, 36, 280 (2010).